Furst Impression, or "Frankie" as he's known around the farm, is proving himself to be quite the producer! His youngsters are eye-catching and wonderfully elastic. Frankie excels in the dressage ring, but also seems to quite enjoy jumping -- therefore, we expect Furst Impression's foals to show talent in both areas. With his varied abilities, he makes a great cross with various mare types. 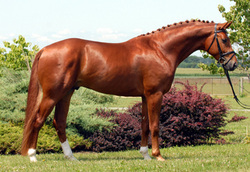 Performance Record: He finished his 100 day stallion testing at Paxton with a very impressive score of 122 points. It was at his testing that we realized that not only do we have a lovely horse, but he is a very good jumper.